That time of year again folks. Xmas festivities abound and the usual St.Stephens day interpro clashes. This coming Monday sees a record 26,200 sold out crowd in Thomond Park for the meeting of Munster vs Leinster. The men in red come into this fixture off the back of their first loss since October 22nd, a narrow Champions Cup defeat away to Leicester thanks to a sublime Owen Williams penalty. Leinster however are in fine fettle thanks to a pair of convincing wins home & away to Northampton, the aggregate score being 97-23 in the blue army’s favour. The 26th starts a run of fixtures that makes for some pretty grim reading; Leinster (H), Connacht (A), Racing (A), Glasgow (A) & finally Racing (H). The hope is that with three Champions Cup losses so far Racing 92 will provide less resistance than is usual, but we never know what French team will turn up do we? Munster need four wins from the next five games to keep in touch on both the PRO12 & Champions Cup fronts, and I’m not gonna be the one that calls the loss! 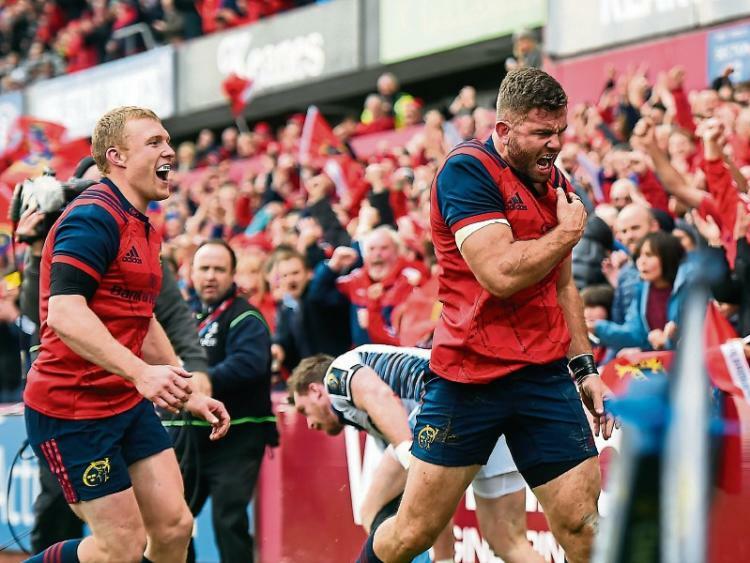 Considering the Jamison Gibson-Park vs Ruan Pienaar farce at the start of the season, I’m amazed that the IRFU & David Nucifora are even entertaining the possibility of Jaco Taute staying in Munster beyond next week. Even more outlandish is that the Western Province/Stormers may even consider such an approach, given the current state of South African Rugby both domestic (Lions you are excused) and international. The Springboks have won four tests this year, FOUR! They have recorded a first ever home reverse to Ireland, a first ever loss to Italy and also notched up what seems to be fast becoming an annual defeat to Argentina in the Rugby Championship. I have a straightforward solution to a straightforward problem, too many tried and trusted players have gotten comfortable in their positions. Allistair Coetzee and Heyneke Meyer before him have failed in their duty to keep the team competitive. Damian de Allende (handsome man that he is) Lionel Mapoe & Jan Serfontaine, not up to scratch. Jesse Kriel is a genuine superstar however, and who better to pair him with than, JACO TAUTE! Going to do this a little differently this week and directly compare the two back row units. Naturally had Leo Cullen selected the usual suspects of O’Brien, Van der Flier & Heaslip my job would have been a lot more difficult. Rhys Ruddock is dependable, reliable, consistent & is into the 100’s in Leinster caps. Right now though he is about a light year away from the current Irish squad. Peter O’Mahony while he is not quite so far away, but still has plenty of work to do before the Six Nations to ensure he is in contention for the 6 jersey. 11 months out will scupper your fitness and match readiness of course, however PO’M has slowly but surely raised the intensity every game to get back to his best. Dan Leavy’s 15 minute international cameo against Canada was pretty impressive by my eyes. I’d be a little undecided about his ability as a 7 in future, seems to be a couple of inches too tall and a little bit on the rangy side for pilfering ball, maybe a switch to 6 would be more appropriate, certainly he brings a different take on the game of rugby to bruisers such as Ruddock & O’Mahony above. Tipperary’s own Tommy O’Donnell is probably the best out and out openside flanker in the country right now, except for Josh Van der Flier (dammit there’s always one!). As strong as his Tipp mates Donnacha and Denis, O’Donnell has a surprising turn of pace for a barrel chested brute of a man and is more than capable of rivaling anyone in the turnover stakes. And now for something completely different, JACK CONAN is a far better player than CJ Sta… Nah, no point in even trying to be funny here. The only reason CJ Stander had been shoehorned (Ireland only) from 8 to 6 is because Jamie Heaslip had an “oh sh*t” moment and started playing out of his skin around this time last year. Credit where its due, 33 year old Heaslip is pretty much indispensible to the Green Machine these days. At 26 and 24 respectively, Messrs Stander and Conan are the future for Munster, Leinster & Ireland. Both are of a fairly similar size and build (6ft 3in & 114kg), both play a very similar style of, ahem, “direct running” rugby & both are held in very high regard by their peers. The difference? Stander has got IT, whatever it is. South Africa’s loss is Munster & Ireland’s gain, CJ is wholly respected by players and fans of all provinces (bar a few bitter blues) or his passion, how he speaks truthfully & honestly about anything to do with rugby & also I believe how he has conducted himself since becoming an Irish international, you would have thought he was Limerick born & bred. Jack Conan only made his pro debut in 2014, contemplated quitting rugby barely a year after taking it up and has struggled over the past 12 months due to the rise of the aforementioned Van der Flier and Leavy coupled with some niggling injuries. You’d be forgiven for forgetting his name, such has been the whirlwind in the Leinster and Ireland back row since his debut in World Cup warm-up against Scotland last year. He is nailed on as Jamie Heaslip’s successor in blue, and will battle Stander all the way for the Irish no.8 jersey. Munster: Simon Zebo; Darren Sweetnam, Jaco Taute, Rory Scannell, Ronan O’Mahony; Tyler Bleyendaal, Conor Murray; James Cronin, Niall Scannell, John Ryan; Jean Kleyn, Donnacha Ryan; Peter O’Mahony (Capt. ), Tommy O’Donnell, CJ Stander. Replacements: Rhys Marshall, Dave Kilcoyne, Stephen Archer, Billy Holland, Jack O’Donoghue, Duncan Williams, Francis Saili, Andrew Conway. Leinster: Zane Kirchner; Isa Nacewa (Capt. ), Rory O’Loughlin, Robbie Henshaw, Barry Daly; Ross Byrne, Jamison Gibson-Park; Cian Healy, James Tracy, Tadgh Furlong; Ross Molony, Mike McCarthy; Rhys Ruddock, Dan Leavy, Jack Conan. Replacements: Richardt Strauss, Peter Dooley, Michael Bent, Ian Nagle, Dominic Ryan, Charlie Rock, Noel Reid, Tom Daly. It’s gonna be a tough one, contrasting fortunes in their previous fixtures would seemingly give Leinster the edge. 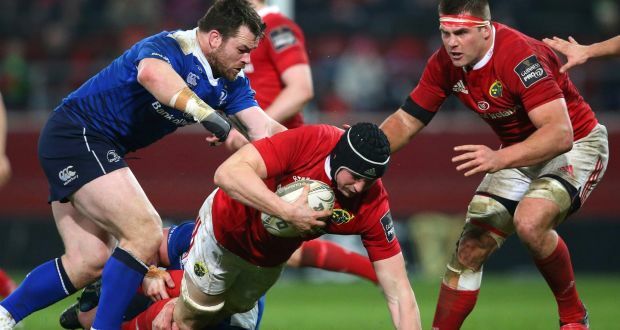 Munster’s stronger team selection would however seemingly give them the edge. It’ll be tighter than a camels arse in a sandstorm, but I believe the 16th and 17th men will see Munster through. Also, make sure to check out our Old Rivalry YouTube Series in preview of the fixture! Damn you Leinster and your weakened team!